In loving memory of my dear husband and our dear daddy. 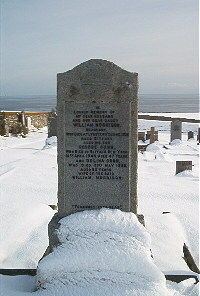 William Morrison merchant died at Lybster 11th June 1938 aged 61. Son George Gunn died in Buffalo New York 12th April 1949 aged 47. Wife Dolina Gunn died 31st May 1956 aged 83.